The Short Version: As the engineering capital of the South, Huntsville, Alabama, is a distinctive and brilliant place to call home. You can find entertainment and romance around every corner in this tech-savvy city. The downtown area offers plenty of five-star restaurants and breweries to spend an evening with a date, but it also supports out-of-the-box date venues, including museums, parks, and escape rooms, where adventurous couples can share a memorable experience. During the 1950s and 1960s, Huntsville housed some of the greatest engineers of the age, including Dr. Wernher von Braun, a German pioneer of rocket technology and space science in the U.S. These big thinkers were based at the Redstone Arsenal where they worked on Jupiter-C, the rocket that sent the first U.S. satellite into orbit, as well as the Saturn boosters used in NASA’s Apollo Lunar Landing Program. Today, almost 50 years after the Apollo moon landing, Huntsville has continued looking to the future and preparing for the next giant leap for mankind. “Huntsville’s rich in space history, and we’re looking forward to the next 50 years of space development,” said Charles Winters, Executive Vice President of the Huntsville/Madison County Visitors Bureau. Huntsville is a tech-savvy city where couples can always find an engaging date activity. Photo Credit: David Warren. 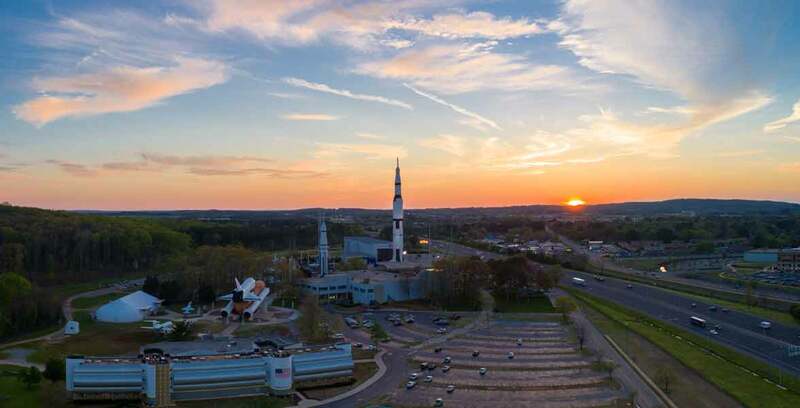 Throughout its remarkable history, Rocket City has relied on the imagination and ingenuity of its people to power it forward. Many Huntsville residents are smart, capable, and goal-oriented individuals whose ambitions are as high as the stars themselves. Of course, some people’s daydreams are a little closer to home. Maybe you’re more interested in rocketing into a fun date than rocketing into space. After all, what’s space exploration without someone to keep you grounded? 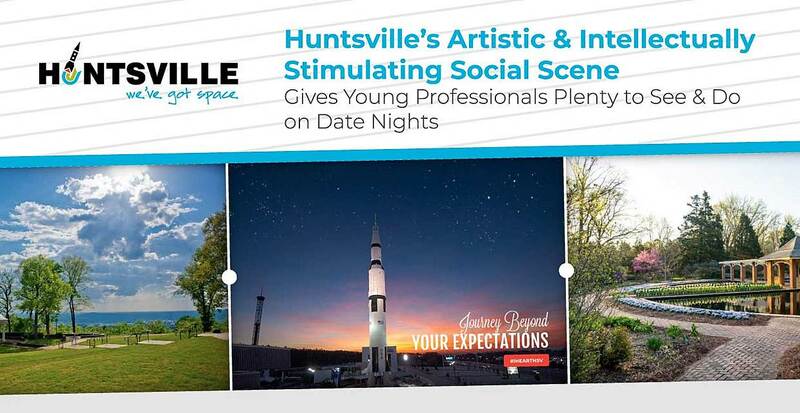 Fortunately, Huntsville’s social scene is just as exciting as its technology industry and has many recreational activities, award-winning restaurants, and community events to keep couples occupied in their off hours. We’ve highlighted some of the best date spots in town to inspire couples to explore and enjoy their surroundings. 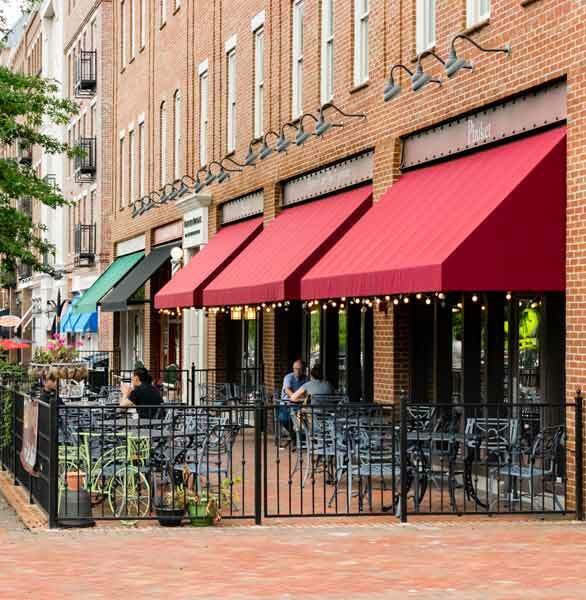 Downtown Huntsville is a hub of activity with streets full of fine dining options, cafés, breweries, and local watering holes. Everywhere you look, you’ll see quaint spots to enjoy a meal or a drink with a loved one. The problem is choosing just one. Kristen Pepper, Marketing Manager of the Huntsville/Madison County Visitors Bureau, suggested starting with a low-key coffeehouse called Alchemy Lounge. You don’t need a reservation or a big appetite to hang out here. It’s a great place to share a warm, rich-tasting cup of coffee and re-energize yourself before a fun evening out. This modern establishment believes in “counter coffee culture,” which means highlighting local flavors and supporting sustainable farms. Huntsville has many eclectic dining options for couples to sample. If you’re feeling fancy, you should head to Purveyor on Church Street or The Bottle on Washington Street. Both of these fine dining establishments have that white-tablecloth and candlelit touch that creates a romantic atmosphere for couples celebrating a special occasion or just treating themselves to a decadent meal. Commerce Kitchen is another noteworthy date-night restaurant. The menu features classic Southern comfort and Cajun foods with an imaginative twist. Chef James Boyce has over 20 years of experience in the culinary scene, and his cooking has been featured on “The Today Show” and on Martha Stewart Living Radio. Speaking of tasty concoctions, Irons One is a distillery known for its flavorful whiskeys and family-friendly atmosphere. The three-story establishment has earned accolades for its great service, quality menu, and hand-crafted whiskeys. The Downtown Huntsville Craft Beer Trail gives couples a chance to explore downtown and drink craft beer together. 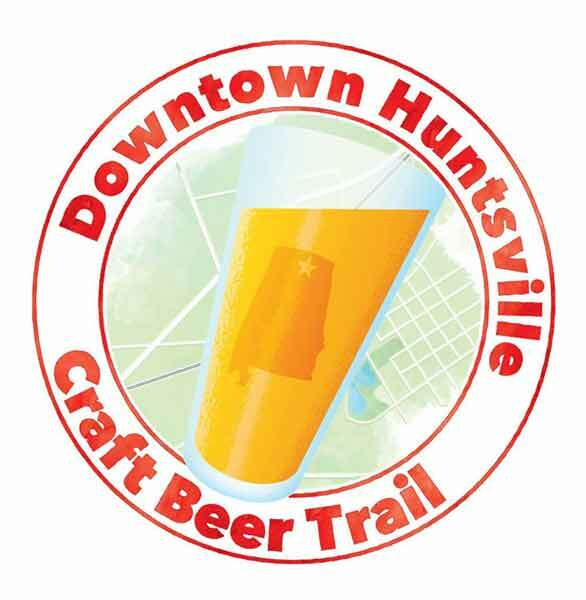 If you enjoy clinking classes and getting a little tipsy with your date, you should consider taking part in the Downtown Huntsville Craft Beer Trail, a challenge to visit 11 breweries around town. You can grab a card from the Huntsville/Madison County Visitor Center and start collecting stamps from participating locations. Once you’ve collected all 11, you’ll receive a free Trail Boss bottle opener. Last but not least, Campus 805 offers great food, great drinks, and great entertainment, so it should be on the must-visit list of any couple in Huntsville. Why’s it called Campus 805? Because it used to be a public school, but now it’s home to two breweries, a pizzeria, an axe-throwing yard, a speakeasy, a dance studio, and an indoor golf arena. You can come here to enjoy paint nights, happy hours, and other happenings. Whether you’re rooting for the Rocket City Trash Pandas or competing in a trivia night at a bar, you don’t have to hide your geeky enthusiasm in this eclectic city. The Lowe Mille ARTS & Entertainment studio hosts concerts on the dock during the spring and fall. If you want to see the colorful community at its best, stop by the Lowe Mill ARTS & Entertainment studio on Seminole Drive. This warehouse used to be a textile mill, but now it is a creative space where artists create, display, and sell their work to the public. The historic factory building holds 18 studios where over 250 artists work in an open environment. The Lowe Mill puts a fun twist on a traditional art gallery by allowing people to interact with local artists and view live performances. You can also take art classes and workshops here. You’re surrounded by conversations at this intellectually stimulating venue, and that makes for a wonderful date experience. You can further explore the artistic side of Huntsville by viewing a performance at the Huntsville Ballet Company or walking through seasonal exhibits at the Huntsville Museum of Art. Of course, dates don’t have to be about dressing up and doing something fancy. You could always take a date bowling at the Stars and Strikes or get your heart pumping by axe-throwing at RockAxe City Throwing Club. Huntsville offers many fun, out-of-the-box date activities to inspire conversation and help you create memories with your significant other. Monte Sano State Park is a natural date spot because it offers many gorgeous views all year round. You can enjoy the fresh mountain air and go hiking, biking, or camping with your partner. If you have a dog, you can bring your pup along as the third wheel. The park has 20 miles of hiking trails and 14 miles of biking trails to explore. Though you may feel like you’re in the middle of nowhere when you’re on property, Monte Sano State Park actually isn’t that far from downtown Huntsville, so you can start your date with an outdoor picnic and finish it with an intimate drink at a favorite bar. 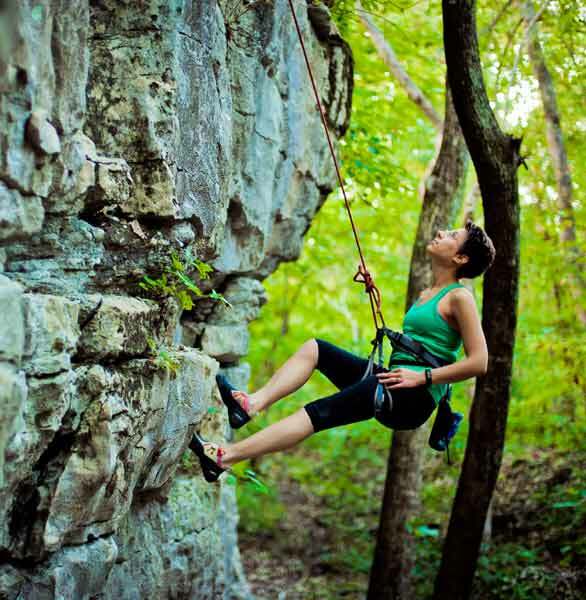 Monte Sano Park offers a natural playground for daters to explore. It’s easy to find a heart-pounding activity in a public park, and couples often find getting away from the hustle and bustle of the city can help them relax and enjoy each other’s company. Green Mountain Nature Trail is another favorite among outdoorsy couples. The 72-acre park surrounds Sky Lake and features a beautiful open-air pavilion, picnic areas, and a covered bridge. Many couples take a trip here to snap some romantic photos in front of the picturesque covered bridge, and some have even planned proposals around this local landmark. 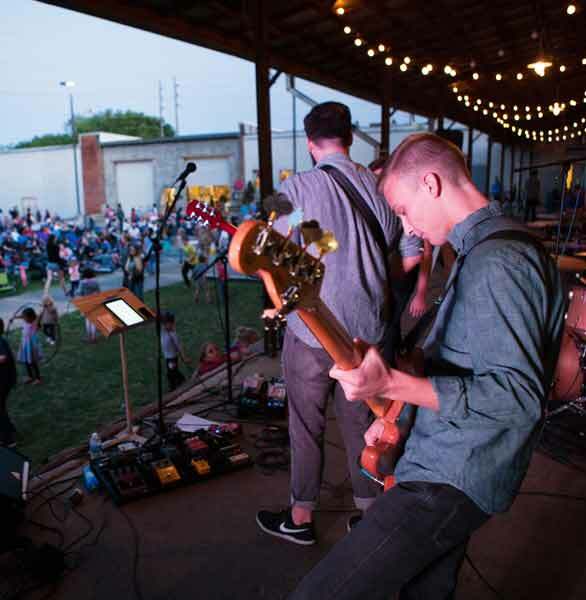 The best date activities involve going out and doing something memorable with a partner, and that’s what Huntsville’s community festivals are all about. The Big Spring Crush Wine & Food Festival delights the senses every September by serving up 150+ wines from all over the world. You can pair your wines with a hot meal from a local food truck and even go grape stomping to really put your stamp on the evening. The Panoply Arts Festival is Huntsville’s largest arts and culture festival and generally attracts thousands of people of all ages. The weekend-long event usually takes place at the end of April and showcases local artists, musicians, and street performers. No matter how long you’ve been together, it never hurts to shake up your date routine by attending a festival, planning a picnic, or going on a hike. Exploring Huntsville’s community events and parks can bring a spark of excitement to your relationship and give you an experience you’ll talk about for years to come. By investing in the future, Huntsville has lived up to its reputation as the “Star of Alabama” and one of the smartest cities in the South. The city has flourished thanks to its far-reaching and forward-thinking culture, and that atmosphere makes it an exciting place to find romance and build a life together. In the next year, Huntsville residents plan to continue using their brainpower and creativity to make the city and the world a better place. While local engineers work on a spacecraft that can one day take astronauts to Mars, city planners are working on a construction project closer to home. Once it’s completed, MidCity Huntsville is expected to become a shopping and entertainment hub in the city with walkable streets lined with places to take a date. Whether you’re exploring local breweries or shaded picnic areas, you can create lovely memories by enjoying date venues that are every bit as interesting as Huntsville’s resident population.